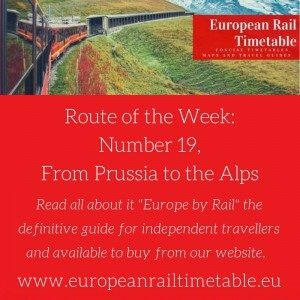 This month we are looking at Table 60 which crosses Germany, the Czech Republic, Slovakia and Hungary. Table 60 provides a summary of the principal trains with more detailed services in the country sections. The entire route can be completed in one day by using the single direct EuroCity service, named Hungaria. But, with four capital cities and some beautiful scenery to explore, it is worth breaking the journey at one or more of the stops. For the last part of this journey, we depart Bratislava hlavná stanica and head towards our final border crossing at Štúrovo. The section of the journey leaving Slovakia offers some lovely views across the Danube towards Hungary. The train passes through some pretty little villages and hillside vineyards as we make our way towards our final destination, Budapest. The grand capital city of Budapest is a popular destination for millions of tourists every year keen to enjoy its indulgent spas, fairy tale architectural sites and cultural attractions. The Danube divides the city into its two parts; the photogenic old district of Buda on the west bank and the more modern and commercial Pest on the east bank. Exploring the city is easy on foot, but those with limited time should consider the Budapest Card (€22,00 for 24 hours) which grants unlimited travel on public transport and discounted or free admission to museums and baths. There are also plenty of sightseeing tours available by bus or, for some unique views of the city from the river, opt for a boat tour. Other highlights in the city include a trip on the Castle Hill funicular (dating back to 1870) which climbs slowly to the pedestrianised district of Old Buda for some spectacular views from Fishermen’s Bastion or why not simply relax in one of the many grand thermal spas? It’s also worthwhile taking a walk along the famous Chain Bridge, the first permanent link between Buda and Pest, for picture perfect views of the enormous, iconic parliament buildings. This month we are looking at a large Table from the International section of the timetable which crosses Germany, the Czech Republic, Slovakia and Hungary. Table 60 provides a summary of the principal trains on this route but more detailed tables for each section can be found in Tables 840, 1100, 1150 and 1175. The 1291 kilometre route can be completed in one day by using the single direct EuroCity service, named Hungaria, which leaves Hamburg Altona at 06.36 and arrives at Budapest Nyugati at a reasonable 20.19. However, with four capital cities and some beautiful scenery to explore, it is worth breaking the journey at one or more of the stops. Last week we were in Brno in the Czech Republic from where we now depart, travelling south-east towards Břeclav, located at the border with Lower Austria on the Dyje River. From Břeclav there is an easy connection over the border into Austria to Vienna (Wien) and Graz. Those that have travelled directly from Hamburg on the 06:36 EC service will have just under an hour to wait for the 17:55 RJ service into Austria meaning you can squeeze yet another capital city into your journey (on top of the four on the main route) and arrive in Vienna in time for an evening stroll and dinner. Travellers choosing to continue on the Hungaria service, now head towards the Slovakian border at Kúty before arriving into capital city number three, Bratislava. Fans of the Slovakian capital will argue that this is a better stopping off point than Prague, having just as many highlights but without the crowds. The pretty historical city centre is very compact and cosy, and it is easy to walk from one side to another in a few minutes, so it is a perfect location for exploring in just a day or two. The cobbled streets are packed with lovely cafés and traditional restaurants, whilst in December be sure to indulge in the aromas and flavours of the traditional Christmas market in the hlavné námestie (main square). The market is much more traditional and less overtly commercialized than others in the region. There are many baroque palaces and notable churches to explore as well as the prominent Bratislava Castle on the hilltop where there are some great views over the city and the Danube river. After a change to a Czech locomotive we leave Dresden and head towards the border. This part of the journey through the hills of the Elbe Valley to Děčín has some of the finest scenery on this route. Walkers and climbers keen to explore the area can stop at the frontier station of Bad Schandau to gain access to Saxon Switzerland national park which straddles the German/Czech border. The two countries work together to manage and protect the entire region of sandstone cliffs, steep canyons, and heavily forested slopes. We now arrive in our second capital city, beautiful Praha. First stop is Praha Holešovice in the north of the city which is connected to the centre by the metro, however most passengers disembark at the art nouveau station of Praha hlavní nádraží which is just a short walk from the main attractions in Old Town Square and Wenceslas Square. This city attracts thousands of visitors every year to its maze of cobbled lanes and hidden courtyards, keen to experience its famous beers, art and fairy-tale architecture. The city is served by an efficient, fast and clean public transport system including metro lines and trams to transport you easily around the main attractions. The next stop is the second largest city of Czech Republic, Brno. Home to experimental architecture, such as the Unesco-protected Vila Tugendhat, the city also has several more ghoulish attractions such as the fascinating crypt in the Capuchin Monastery or the notorious prison inside the spooky hilltop Špilberk Castle. Brno also has its fair share of vibrant cafes and bars, many picturesque buildings, churches, squares, sculptures and fountains making it a worthwhile alternative to avoid the tourist hordes in Praha. This month we are looking at a large Table from the International section of the timetable which crosses Germany, the Czech Republic, Slovakia and Hungary. Table 60 provides a summary of the principal trains on this route but more detailed tables for each section can be found in Tables 840, 1100, 1150 and 1175. The 1291 kilometre route can be completed in one day by using the single direct EuroCity service, named Hungaria, which leaves Hamburg Altona at 0636 and arrives at Budapest Nyugati at a reasonable 2019. However, with four capital cities and some beautiful scenery to explore, it is worth breaking the journey at one or more of the stops. The Hungaria is one of the oldest express trains still in operation, but today uses Hungarian Railways’ latest air-conditioned coaches, including a restaurant car and seats with power sockets and free Wi-Fi. The train departs from Altona, a smaller terminus station, 10 minutes west of Hamburg Hauptbahnhof. The short hop affords some interesting views of this fine city before the train heads out into pretty countryside and forests of eastern Germany. The train arrives in Berlin Hauptbahnhof in under 3 hours, leaving plenty of time for a leisurely breakfast and sightseeing in this bustling capital city where there is always something going on. It’s possible to walk between the main sights, or if you have a Eurail Pass valid in Germany, you can use the S-Bahn metro lines around Berlin for free. You can re-join the train at either Berlin Hauptbahnhof or the smaller Südkreuz station where we depart for Dresden. The historic Dresden Hauptbahnhof was built in 1898 but like much of the city, it has been extensively redeveloped in recent years to rectify wartime damage and neglect. The station has a unique layout on two levels. The main station building and terminal platforms are located centrally on the lower level, flanked by through tracks on either side raised on viaducts. The classic view of the city’s baroque spires, towers and domes, is from the banks of the river Elbe but there are equally stunning vistas from the spire of the cathedral or the Residenzchloss (Royal Palace) which now houses five museums. Lindau near the borders of Austria and Switzerland is the final destination and terminus on the Bavarian Allgäu railway. This historic town is actually an island on the eastern side of Lake Constance and connected to the mainland by a road-traffic bridge and a railway dam leading to Lindau Hauptbahnhof. Arriving in Lindau you are greeted with an impressive panorama of the Swiss and Austrian Alps and Lake Constance which stretches out behind the world-famous harbour entrance with its Bavarian lion and white lighthouse. If you are feeling fit you can climb the 139 steps to the top of the 136m lighthouse for stunning views out over Lindau and the Bodensee. The old town still boasts the romantic alleys and dreamy courtyards of its medieval past, full of colourful boutiques, cafés and restaurants. In summer tourists flock to the lakeside promenade, widely regarded to be the prettiest in Lake Constance. The Bavarian Allgäu railway running from Munich to Lindau weaves its way through some historic towns such as Ulm (famous for being the birthplace of Albert Einstein and having the tallest church steeple in the world), Kempten (the largest town of the Allgäu) and Oberstdorf. Oberstdorf is a busy winter resort, principally a skiing and hiking town and is the highest market town in Germany. The terminus station is reached in just over 2 hours from Munich and is the most southern railway station of Germany. Oberstdorf is served by around 40 daily intercity and regional-express services operated by Deutsche Bahn and Regentalbahn so it is also a good base from which to explore the region. There are a large number of valleys in the area around Oberstdorf, many of which are not only scenic, but are often starting points for walks in the mountains. The beautiful Oberstdorf Nebelhorn is known for its impressive views of 400 mountain summits. However, you don’t need to be an experienced hiker to enjoy the scenery as many of the summits can be reached by cable car. The new mountain restaurant at the top of the Nebelhorn offers a 270-degree panorama so you can enjoy a meal with a spectacular view. Journeys through the rail routes of the Allgäu region are primarily dominated by the Alps Mountains. However, the region is also comprised of numerous lakes, forests and small romantic towns that contribute to the regions natural beauty. Hiking trails, cycling routes, and ski runs crisscross the land, and the entire region is dotted with health resorts. There are many notable attractions to visit in this region such as the famous fairy-tale Bavarian castles of Hohenschwangau and Neuschwanstein, easily reached from Füssen station near the Austrian border. Direct trains from Munich run every two hours and are operated with modern, air-conditioned double-deck trains. The best views are from seats on the left-hand side on the upper deck, from here you can enjoy great views of Neuschwanstein castle. Tourist-busy Füssen provides the main access point to the castles either by shuttle bus or by foot but also boasts a medieval fortress the Hohen Schloss, a former Benedictine monastery of St Mang and a very attractive old town so is worth an explore in its own right. Continuing our new feature we are focusing in on some of the more interesting tables in our timetables, exploring the routes that it details and the cities, history and scenery along its lines. Throughout January we will be looking in detail at Table 935 and its routes through Southern Germany. Readers wishing to explore the scenic Allgäu region of southern Germany will need to consult the unwieldy, but intriguing, Table 935 to plan their journeys. The table covers a series of lines which link the cities of München, Augsburg and Ulm with the mountain resort of Oberstdorf and lakeside town of Lindau. The table itself is quite complex as various services interconnect with each other at several railway hubs, most notably Buchloe, Memmingen, Kempten and Immenstadt. To complicate matters further, many trains run with two portions, splitting or joining en-route. We have considered simplifying this table by showing each route separately, but this would markedly fail to demonstrate the wonderful way the various services interconnect with each other to provide regular journey opportunities between the towns and cities of the area. Most services are operated by regional trains so it is easy to explore the region using one of the excellent regional tickets, such as the Schönes-Wochenende-Ticket or Bayern-Ticket. Closer inspection of the table will also reveal four daily EuroCity trains in each direction running to and from Zürich (on which regional tickets are not valid). However, there is currently electrification works on the route via Memmingen to enable faster services, this will result in variations to timings during certain periods as the work progresses. This week we are looking at: Route No. 14: “From Flanders to the Rhine” which begins in Lille, passing through Brussels and Liège, ending in Cologne. The Thalys and Deutsche Bahn trains from Brussels to Cologne all follow the same route. They dash across the flatlands of Brabant to reach Liège (Luik in Dutch and Lüttich in German), an industrial city that sprawls along the west bank of the River Meuse. A new high-speed line from Liège to Aachen opened in 2009, thus marking the end of a slow dawdle through the hill country of eastern Belgium to reach the Germany border. Nowadays, the fast trains dive through tunnels and miss the best of the scenery. Of course, you can if you wish still follow the old line via Verviers to Aachen. There are hourly trains on this route, all requiring a change of train at Welkenraedt (ERT 400 & 438). Every day, thousands of travellers speed across northern Germany on the main rail routes from Cologne or the Ruhr region towards Berlin. The previous route in this volume describes one such journey. It covers a lot of ground at speed, but it’s hardly a great rail adventure. Yet so often in Europe, even just a modest diversion from the main line can transform a prosaic run into something very special, and nowhere is that better illustrated than in journeys across northern Germany. You can cut off to the south of the main railways which link Hannover with Berlin to discover the glorious landscapes of the Harz Mountains, a region which boasts Europe’s finest network of narrow-gauge steam railways. Even if you are not a train buff, the scenery alone justifies an excursion into the Harz region. Moreover, the Harz steam trains always go down a treat with children and families.